Pancakes are one of my favorite foods for breakfast and brunch, especially Blueberry Pancakes. They’re a crowd pleaser, as pretty much everyone likes them. But, you can’t make a ton of them easily. Until now. Enter this Sheet Pan Blueberry Pancake recipe. Yep. Making pancakes in a sheet pan is a stroke of genius. It lets everyone eat at the same time, and their food is warm. Know what else? These sheet pan pancakes are vegan. That’s right. If you, or your friends, are practicing vegans, they can have these. There’s no eggs, milk, or butter in the recipe. 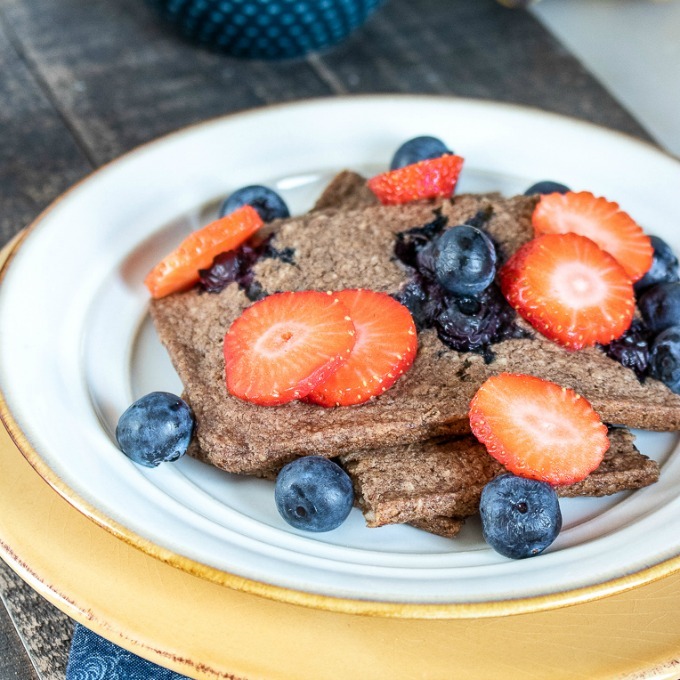 These pancakes are also more like buckwheat pancakes in texture than the light, refined flour pancakes many people are used to. The oats makes them heartier, and more satisfying. Links may be commissioned. Thanks for supporting small business by shopping through them. There are a few things you’ll want if you’re making this sheet pan blueberry pancake recipe. The first is a really good blender. A food processor also works well for this recipe. You’re doing a lot of work in this recipe, and a blender makes short work of it. You’re also going to want a quality maple syrup. The good stuff is so totally worth the money. And, of course, a sheet pan. We like this sheet pan for even cooking and nice sides. Make blueberry pancakes for a crowd with this delicious sheet pan recipe. Perfect for brunch or a breakfast for a crowd. It's vegan, vegetarian, and Paleo and Whole30 friendly, too. 1. Preheat oven to 375°F and grease a small, rimmed baking sheet with a tablespoon of olive oil. 2. In a high-powered blender or a food processor, combine the remaining olive oil, banana, rolled oats, almond milk, maple syrup, baking powder, vanilla extract, and cinnamon. Blend until thick and smooth. 3. 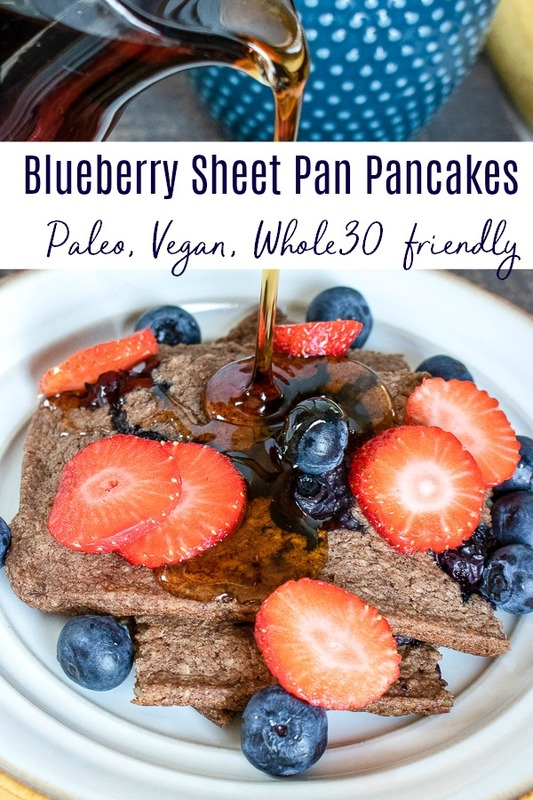 Pour the pancake batter onto the greased sheet pan and top with one cup of the blueberries. 4. Place in the pre-heated oven and bake until the batter is set in the center, slightly puffed up, and golden brown around the edges, approximately 20-25 minutes. 5. Remove from oven and cool for 10-15 minutes before slicing. Serve immediately with additional maple syrup, the remaining blueberries, and fresh, sliced strawberries, if desired. Enjoy! If you’re cooking for a crowd, you can make a couple pans of these sheet pan blueberry pancakes at the same time. Just double the recipe, and increase the baking time ever so slightly. While fresh blueberries are the best, you can definitely use frozen. I mentioned that these pancakes are vegan, and therefore vegetarian. But they’re also Paleo and Whole30 diet friendly. Try them. think they’ll become part of your regular weekend breakfast routine. 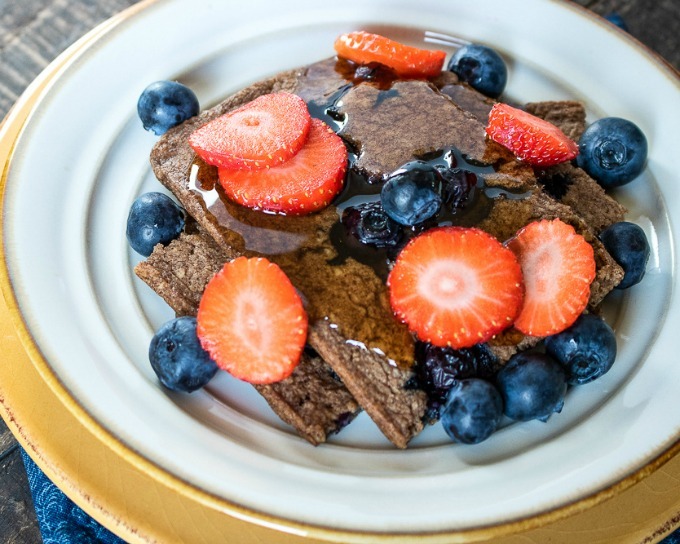 Like this vegan, paleo pancake recipe? Don’t forget to pin it for later.